These were my dumb phones. In fact other than a short-lived Treo (returned!) this is every phone I owned prior to the first iPhone. I know, I know. I should have sent them to soldiers. But I didn't. Earlier today, all of us from Gizmodo were talking about how much money we used to pay for dumb phones, and I dug up this old picture. And then I was suddenly nostalgic! I mean, I wouldn't take any of those phones back on a bet. Not even the T68i, which was the world's best phone prior to the iPhone. 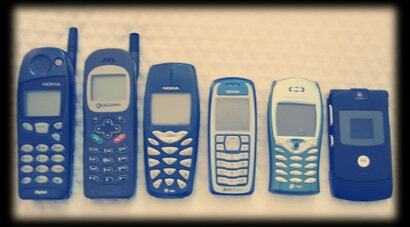 But I do have a lot of fond memories of playing snake on that Nokia to the far left. And then there was the time the cops kicked in the door while I was playing a bowling game on that Nokia in the middle. And I remember when I bought that RAZR it was the hottttttttnessssss. Today, they're all basically junk. Just like my first iPhone. And my second iPhone. And my old Nexus One. But for some reason, I'm more nostalgic for these pieces of junk than those. Maybe just because they're from a bygone era. What about you? Before the smartphone came along, what did you have in your pocket?